hi there this is my gsd teiga she will be 2 this year. she loves to go swimming and have long walks. she loves playing with other dogs of all sizes. Hi Sian. 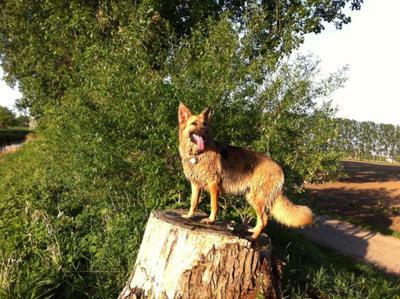 Thanks so much for taking the time to come here and share your own personal German Shepherd story and picture of your beautiful German Shepherd Dog Teiga with us all here. And what a great picture of Teiga too. She looks so comfortable - just like she has just conquered that big old tree stump and is waiting for her next challenge. Beautiful. Did you take the shot? Or did someone else take this photo for you? Either way, it is a great photo of Teiga. Nicely done - she is so pretty! By the way, please tell us also precisely what you think about the above German Shepherd tale that you just read above by leaving us some fascinating feedback below. Thanks for reading and please come back again.